All The Way is an extremely ambitious undertaking and a rarity -- to say the least -- for a Broadway show. Although it features a major star in the lead role (Bryan Cranston as Lyndon Johnson), there are more than twenty other actors playing approximately fifty characters -- and -- it's not a musical. The play is about the passage of the 1964 Civil Rights Act, a crucial moment in American politics that many young people today know little about and others who lived through it have forgotten. This was an extremely volatile time in American history when civil rights workers were being murdered in the south for fighting bigotry and racial segregation, yet the play manages to give an entertaining history lesson about the passing of a piece of landmark legislation without being preachy or pedantic. All The Way takes place during a time when television was not much older than a teenager, so given how far we've come technologically, I'm calling it a period piece that utilizes modern staging techniques. Cranston is the centerpiece of the play and is onstage for nearly the entire show, with other cast members coming and going, many sitting in jury boxes on both sides of the stage as other action takes place. There is a rear screen projecting numerous backgrounds (still and rolling) to create a sense of place, be it a rally in the south or a speech in the White House rose garden. Robert Petkoff plays Hubert Humphrey, who was crucial in getting LBJ the necessary votes to pass the 1964 Civil Rights Act, which is the focal point of the play. My father worked for Humphrey after he was elected Vice-President, and the photo I have of them together in the White House has always been a huge source of pride for me, so it was exciting to sit down with Petkoff and discuss the play. "Humphrey was attacked by other liberals for reaching across the aisle and his response to that was 'this is what we're supposed to do,' because pure ideology in politics is poison and ultimately prevents you from getting anything done," said Petkoff. His strong opinions about Humphrey as well as our current domestic political situation are passionate and intelligent. "Hubert Humphrey sincerely believed in civil rights," said Petkoff. "There's an honor in him that I admire so much. We need politicians like that today," he added. "If we had 70 politicians like Humphrey, the country would be in much better shape." Petkoff also understands Humphrey's weaknesses and he brings them to his performance. "LBJ was tough and mean, but Humphrey was truly nice and not Machiavellian enough to be president," said Petkoff. As for LBJ, he was often loud and crass but he also had a quiet menace about him that could be extremely intimidating, and anyone who has seen one episode of Breaking Bad is more than aware of Bryan Cranston's ability to evoke fear in people. Cranston is equally funny (as was Johnson) so the show is not short on laughs either. An intelligent show requires requisite actors, and besides Petkoff, I was also able to speak with Michael McKean, who plays J. Edgar Hoover and has great insight into the material. "It's an accomplishment to write a thriller and this play is just that," said McKean. "You know what's going to happen with the Civil Rights Bill, but you still can't help being on the edge of your seat." Of Hoover McKean said: "My character's focus is fairly narrow. It's all about destroying Martin Luther King because there was no one Hoover feared more than King." Brandon J. Dirden plays Martin Luther King, Jr. in one of the show's many standout performances. "King was charismatic and beautiful -- everything Hoover wasn't," added McKean. All The Way is a long show with a great deal of dialogue, but fine acting along with a compelling script and creative staging can negate speechifying and that certainly holds true here. "This is not a documentary on LBJ's first 11 months, said McKean. It's an interesting, wonderful play." Both actors are thrilled to be working with Cranston. "People who know Johnson will recognize him instantly," said Petkoff. People unfamiliar with Johnson will feel like they really get to know him." My father told me many stories about LBJ, and I've read even more, so I can't imagine anyone better than Bryan Cranston playing him. LBJ used to give other politicians what became known as The Johnson Treatment: "It was an incredible blend of badgering, cajolery, reminders of past favors, promises of future favors, predictions of gloom if something doesn't happen. When that man started to work on you, all of a sudden, you just felt that you were standing under a waterfall and the stuff was pouring on you," wrote author Lisa Jardine. All The Way opens on Thursday, March 6. It's an important play for all people to see, but attendance should be mandatory for anyone in an elected office. 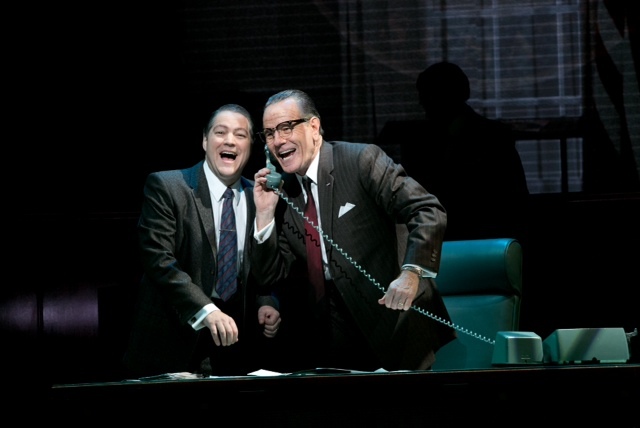 Robert Petkoff and Bryan Cranston as Hubert Humphrey and Lyndon Johnson. Photo courtesy of Jeffrey Richards Associates.